Yes its true and its not just cool again, its so good for your hair too! According to Vogue Australia the loved vintage silk scarfs with brights and bold patterns to the luxe velvet big lush ones, they are the must have hair accessory for 2018. These babies not only look cute as hell but they can actually save your hair from further damage if already your hair in fine, fragile and snapping. The soft texture glides through the hair instead of pulling like most hair ties do. Perfect for the babes who olaplex at night time… tie your hair up in a scrunchie. It is literally life changing for you and your hair. 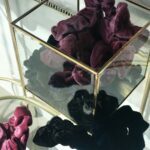 These are just a couple of colours in our velvet scrunchie range that we have available in the studio. So pop in and match up your outfit (or Pjs) when purchasing in store!